← Allen Dronsfield is Inducted Into the FSA Hall of Fame. 2019 01 14. 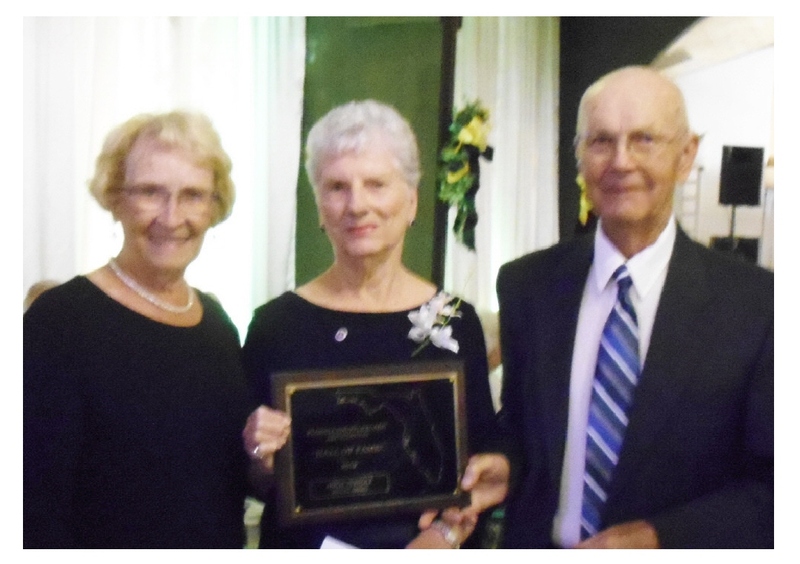 Linda Rebholz Inducted Into the FSA Hall of Fame, Special Award. 2019 01 14. HALL OF FAME ACCEPTANCE BY LINDA REBHOLZ. IN 1999, SHUFFLEBOARD, NOR A NEW HUSBAND, WAS ON MY RADAR. I WAS A WIDOW, MANAGING MY RENTAL PROPERTY, VOLUNTEERING AND SINGING IN THE CHURCH CHOIR. GOD HAD OTHERPLANS USING A FARMER FROM INDIANA. PHIL IS A DEDICATED SHUFFLEBOARD PLAYER, AS YOU WELL KNOW FROM HIS ACCOMPLISHMENTS. THANKS TO ED CUTLER AND THE FORT PIERCE SHUFFLEOBARD CLUB WHO PUT ME TO WORK AS TREASURER AND THE CECD BOARD WHO LATER SENT ME TO THE FSA AS A DELEGATE, I BECAME AN OFFICIAL MEMBER OF THE SHUFFLEBOARD FAMILY. MOST OF ALL I THANK GLEN PELTIER WHO HAD ENOUGH FAITH IN ME TO APPOINT ME AS SECRETARY TO THE FSA BOARD. TECHNOLOGY IS NOT MY THING BUT WHEN I HAVE TROUBLE, I CAN THANK GLENN MONROE WHO HELPS ME LOOK EFFICIENT. I CAN’T FORGET STAN MCCORMACK WHO DISCOVERED THE WRITER IN ME AND I ENJOY DOING HUMAN INTEREST STORES FOR THE SHUFFLER. COLLEEN AUSTIN HAS MADE THE PROJECTS FUN THAT WE HAVE WORKED ON TOGETHER. I KNOW THAT THE OTHER INDUCTEES JOIN ME IN THANKING HER FOR THE EXTRA THINGS THAT SHE DID FOR US THIS MORNING. AS YOU CAN SEE, ALL OF THE THINGS THAT I LOVE TO DO ARE REALLY JOINT PROJECTS WITH MY FELLOW SHUFFLEBOARD FAMILY. AND SPECKING OF FAMILY, I MUST THANK MY HUSBAND FOR ALL THE ADVENTURES THAT WE HAVE HAD TRAVELING TO TOURNAMNETS, NOT ONLY IN FLORIDA, BUT IN MICHIGAN, LAKESIDE, OHIO, AND HENDERSONVILLE, N.C. IN 2005, WE SURVIVED HURRICANE WILMA IN OUR RV. WE WERE IN ZEPHYRHILLS FOR A TOURNAMENT AND PHIL WOULD NOT LEAVE. AFTER THE WIND ROCKED THE RV FOR MOST OF THE NIGHT, I THREATENED TO NEVER ATTEND ANOTHER TOURNAMENT. IT IS WITH HUMBLE GRATITURE THAT I ACCEPT THIS AWARD. THANKS TO LANDY ADKINS, WHO NOMINATED ME, AND THE ENTIRE FSA BOARD FOR YOUR SUPPORT. I HOPE TO CONTINUE TO SERVE WHERE I AM NEEDED. NOTE: Although requested, no induction supporting remarks were received.